Take advantage of this 20.2 acre commercial site zoned B2 – great for retail or potential re-zone for residential development. Fronts on 2 streets and located next to shopping center. 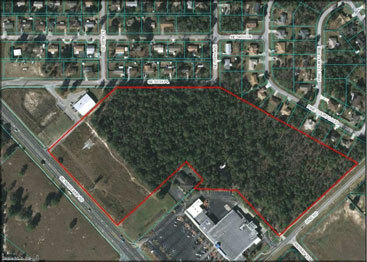 ~560 feet of frontage on SE Maricamp Rd and ~590 feet of frontage on Pine Rd. 3 mile population = 32,534. Average Income = $42,038.00. Traffic Volume for SE Maricamp Rd and cross Rd SE Hwy 464 SE = 25,286.